So, what does it mean when tequilas have the same NOM? Are tequilas made at a shared distillery better or worse than tequilas made at a distillery dedicated to a single brand? Not necessarily, but Patrón Tequila, which is the only brand made at NOM 1492, thinks it is an important enough distinction (and competitive advantage) to warrant a new “Know Your NOM” area of their website. Patrón now invites website visitors to type in the name or NOM numbers of their favorite tequilas to see all of the other tequilas made in the same distillery. This new NOM search functionality is powered by the Tequila Matchmaker app database (a mobile app that we created and maintain.) We get our raw information on NOMs from the official tequila regulatory body, called the Consejo Regulador del Tequila (CRT). They maintain a list of tequilas that are in active production. One thing is for sure, producing only 1 brand of tequila puts Patrón on a small and exclusive list. Only 6% of the active distilleries in Mexico are dedicated to a single brand. To the best of our knowledge, there are only 8 distilleries (out of 139**) that are dedicated to producing a single brand. There are 18 additional distilleries currently producing only a single brand, but are not included in the “known to be dedicated” list because they have either historically produced tequilas for multiple brands, or there is some indication that they are in the business of creating tequila for others. Should you be avoiding brands that are not on this list? Well, since 97.8% of tequilas being made today are coming from distilleries that produce multiple brands, the answer is no. Odds are that many of your favorite tequilas are not the only tequilas made by that distillery. Tequilas made at the same distillery can be different from each other in sometimes subtle, and sometimes dramatic ways. There are so many variables involved with the production of tequila that a change in any one of the ingredients, techniques, or even time of year can change the final product. One example of a brand that provides a unique flavor profile even though it is made at a shared distillery is Gran Dovejo, which is made at a distillery run by the Vivanco family (NOM 1414.) Gran Dovejo has their own Master Distiller, Leopoldo Solis Tinoco, who is there every step of the way to ensure that the final product meets the flavor profile they are looking for. In doing so, we find that Gran Dovejo is different than the other products made in the same distillery. Another example of a distillery that produces distinct brands is the “La Tequileña” distillery (NOM 1146), where brands such as Don Fulano, Artenom Selección de 1146, Cimarrón, and Fuenteseca are produced. This distillery is located in the town of Tequila, Jalisco, and has a wide variety of equipment available. A brand can choose which blend of machinery and techniques to use in order to achieve a specific flavor profile. Is there also a danger of tequilas made in the same distillery tasting the same? You bet. It’s also possible for a tequila brand to buy pre-made “stock tequila” from a distillery, and have it bottled and sold without having much (if any) involvement in the production process. So, the NOM number can tell you some basic information on where a tequila is made, but it can only go so far. And, here’s another variable: It is legal for one distillery to sell tequila to another distillery (and have it delivered via tanker truck). The location of a tequila’s distillation is not publicly disclosed (and neither is the exact source of the agave), but a record is kept somewhere within the walls of the CRT. Because of this, we may never know the exact location of a tequila’s creation, or even how it was created. If you are still wondering why Patrón would bother to list the names of every one of their competitors on their own website through its NOM search, our take on this approach is simple. They are making a subtle but valid point. They built and maintain their own distillery (a costly operation) because the only way they can achieve consistency and quality is by having control of every step of the process. And, you’ll never see a tequila made at the Patrón distillery under another brand name at a lower price. (Putting the same tequila in different bottles and at different price points is not uncommon.) This “all in” investment in the process is one claim that 97.8% of their competitors cannot make and is worth pointing out. Our list of brands is slightly different than what appears within the CRT’s published spreadsheets because we take a curated approach by consolidating brands when appropriate. For example, in the CRT spreadsheet, “Siete Leguas” (NOM 1120) appears as “SIETE LEGUAS; 7 LEGUAS; D’ANTAÑO; ANTAÑO; 7 LEGUAS; SIETE LEGUAS.” We clean this up and list them all under a single brand name with several products. The CRT regularly updates their list, including tequila brands and distilleries that are in active production. Once a tequila brand, or a distillery, stops producing, it is dropped from their list. That’s where we come in. 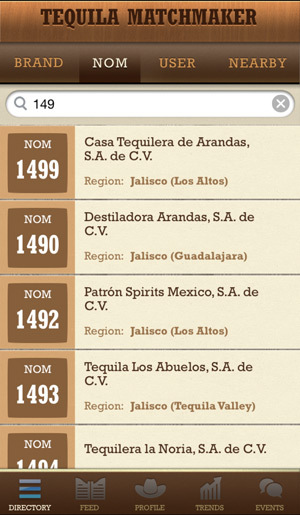 This historical information is recorded, curated, and made available to search within the Tequila Matchmaker app. So, if you find an old bottle, you can still search its NOM number to see where it was made. There are 1,716 brands included in the Tequila Matchmaker database, but only 1,196 of them are currently listed in the most recent update of the CRT’s NOM database. These brands come from 138** different active distilleries in Mexico. Our NOM database is usually updated within a few hours of the CRT’s release of new information. The Tequila Matchmaker app is free, and is available for iPhone and Android devices. Very interesting and valuable data! So what in your opinion is more important..where the tequila was produced or where it was finally bottled? I think most people care about where it was made, rather than where it was bottled. (We certainly feel that way.) Creation of the actual product is, in our view, like producing a fine work of art, while bottling of the product is a mechanical packaging process. I agree, Grover. My hunch though is that most bottling plants are also responsible for diluting down the tequila to 38-40% (assuming they receive the @ 55% alc) using their own water source. The mention of Sierra in that list is intriguing..they have their own distillery yet use Casa San Matias as the bottling plant (or at least they did a while back for some or all production). I dare say there are more distilleries out there bottling some questionble tequilas (not produced by themselves) that would prefer the CRT not to be sharing too much info on their operations! We’re not passing judgement. Simply reporting the facts. Feel free to take whatever you wish from the story. But the fact that 7 out of 8 of this distilleries are not called into question regarding quality (which is what I assume you’re saying) gives brand-owned distilleries a pretty solid endorsement. How do we know?? Surely, if the first statement is accurate, they could easily be shipping tequila off somewhere else and noone would be any the wiser. I’ll be honest, this article does feel a bit like a Patron advert. Any half-decent bar wouldn’t touch the stuff. Why would they when Don Julio is slightly cheaper and vastly superior? Yes, that is correct. Because of this tequila loophole, you could say this applies to every single tequila brand, and not just Patron. Yes, you never can know – which is why we mentioned this in the story. Patron advert? C’mon. Every single time we mention Patron in an objective way we get criticized by the Patron haters. I appreciate your energy and passion about tequila, but if you want to really focus on helping, start calling out diffuser-made products. Thankfully, Patron products show no sign of using a diffuser. Just have to jump in and support Grover on the Patron advert criticism. As Grover said “c’mon”…anyone who know Grover or who uses the Matchmaker app knows there is no bias toward any particular brand but instead great information about ALL brands, their pluses and minuses. Grover does more than anyone I know to educate, illuminate, and propagate information about this incredible spirit. And, he does it in an unbiased, open to all manner. Grover – keep up the great work. We appreciate it. I am extremely glad I found your website Grover. 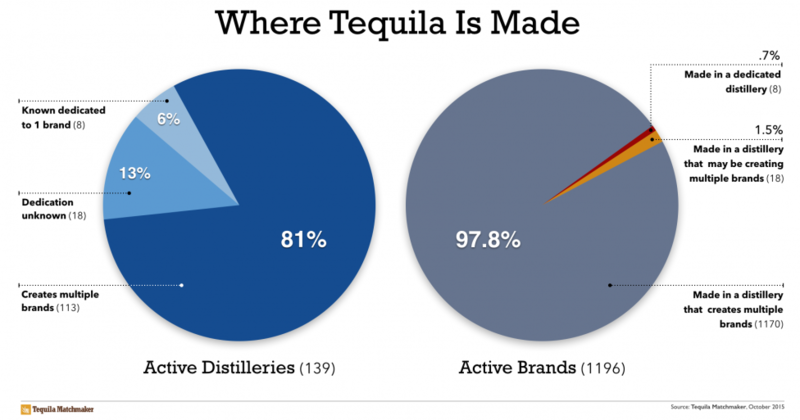 I love Tequilla and have been searching for just this kind of information on the different brands! If it’s not asking you to violate any unwritten principles, I would like to know what specific tequilla YOU drink and why, ie. the flavors you get , the smoothness and the trustworthiness of the distillery! Hi Terry – Thanks! The best place to get all of that information is our mobile app, Tequila Matchmaker. It will show you all of the things that people (including myself) like most, and even shows you information about each distillery. It’s available for free for iOS and Android devices in the app stores. Got it, a very unique and information filled app. thanks so much! Great read. Understanding where your tequila is made is the first step to understanding the true craftsmanship of the spirit. I am by no means saying that you can not share a distillery with ten other tequila producers and not make a good tequila. What i am saying is that if you use the same ovens, same equipment, and same stills, the only thing different from those products is the yeast. Knowyournom.com is a great tool to uncover the truth about your favorite tequila. Yes, Eddie. One exception has to do with yeast, as most distilleries won’t use more than one strain within the facility. This makes the equipment faster/cheaper to clean, and avoids unexpected outcomes due to yeast cross contamination. So, even the yeast used would be the same. Big fan of your work. Have you considered incorporating mezcal into the listings? IN studying this valuable information I have one unanswered question. Please help. Is there anyway of knowing which produces in the Horno/Tahona method and which does diffused/autoclave as their choice? Thank you and cheers. Hey Grover, I’ve come to love your site since being introduced recently. And this article in particular is so informative Thank you both for all of the insights. Article got me wondering about bulk transport to the U.S. Some brands do transport a finished tequila product to the states and then bottle there, right? Any knowledge of how the integrity of the product is ensured and inspected in such a case? And of course the production must all be done in Mexico, but can a brand that bottles in the U.S. actually do any extra distillation in the states before bottling or must the product go straight from transport/storage to bottle in the case of bottling in the U.S.? For such a highly regulated and standardized industry and production as tequila, I was surprised to read that the NOM # can sometimes be deceptive. This is allowed, but only for mixto (not 100% agave) tequila. If it says 100% agave on the label, it must be bottled in Mexico. But you ask some good questions about how that mixto tequila is supervised once it arrives at its destination. I’m not sure, but I’ll do my best to find out and post the reply here. 1) Any type of tequila (mixto or 100% agave) that is shipped out of the USA and bottled elsewhere can not have “100% agave” on the label. It can only be labeled “tequila”. 2) When shipments are sent out of the distillery in Mexico, they are typically at 55% abv, and the tanks are sealed at the distillery by the CRT. When it arrives at the bottling facility, another CRT person is waiting for it. If the seal is broken, then the entire shipment can be invalidated. 3) No other distillation or modifications can occur to the product with the exception of adding water to bring it down to the desired alcohol level at the bottling plant. 4) Each bottling plant outside of Mexico is supervised by the CRT.